Why: Bring in a disposable water bottle for recycling and receive a new reusable water bottle. Supplies are limited so don’t be late! Once again Life University has joined millions of students across the country by making a difference and participating in the 2012 Recyclemania Tournament. Recyclemania is an 8-week recycling competition endorsed by the America College and University Presidents’ Climate Commitment . Life University will take part in the waste minimization portion of the contest, focusing on overall waste reduction. This will include an educational campaign teaching the campus community to cut waste by placing emphasis on reusing materials and source reduction. Stay tuned to the blog for tips on recycling and chances to win prizes as we learn new ways to reduce, reuse and recycle. Be among the first to receive new posts (and increase your chances to win) by subscribing to A Sustainable Life. Newspapers, magazines, and white paper can all be recycled as long as the paper is clean and dry. Plastic wrap, stickers, or rubber bands should be removed, but staples and plastic window envelopes are OK.
RecycleMania trivia question: Paper can be recycled up to _____ times before it is turned into organic waste and breaks down. Comment on today’s post with the correct answer for a chance to win a prize from the Office of Sustainability. The winner will by randomly chosen from correct answers submitted by 5 pm (EST) on March 18, 2011. (Note: Prize must be picked up in the Office of Sustainability). 33 days until Earth Day on the Plaza….will you participate? The following is an excerpt from the book “The Ultimate Guide to Greening your Home”. Making some simple changes to your food buying habits and food choices, can make a significant impact on the environment and your health. Every food purchase you make is a ‘vote’ on how and where you want your food to be supplied. This statement makes sense to me and could be applied in variety of situations. But since its Meatless Monday I see it as asking for veggie meals in your favorite restaurant (if they are not currently available). Supply = Demand. If enough patrons ask for a certain type of meal, I’m willing to bet that you will see changes to the menu! 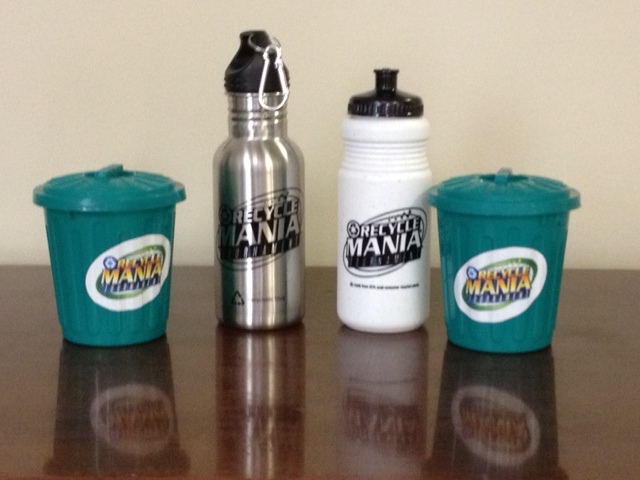 Congratulations to Lucia Paolucci winner of Thursday’s Recyclemania giveaway! Countdown to Earth Day: 43 days left…..see you on the Plaza!